A face in the crowd – Tell my story. 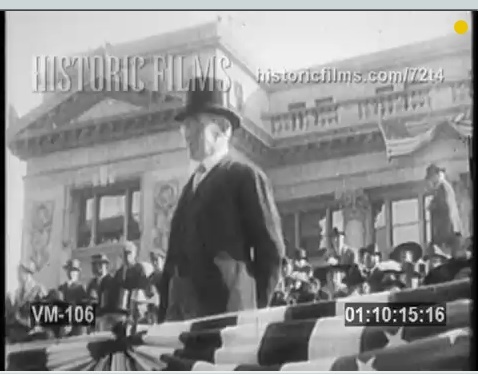 Today I found two different film clips of Woodrow Wilson’s swearing-in ceremony at the U.S. Capitol in Washington, D.C. Emmett attended both of these events, as a newly minted, and then, newly retired congressman. The first one was on March 4, 1913. The clip comes from a film archive source called Historic Films Stock Footage. This is a very short clip of the first inauguration of Woodrow Wilson, but we know Emmett is there; somewhere, in that crowd. He’s sitting among the members of the House of Representatives. 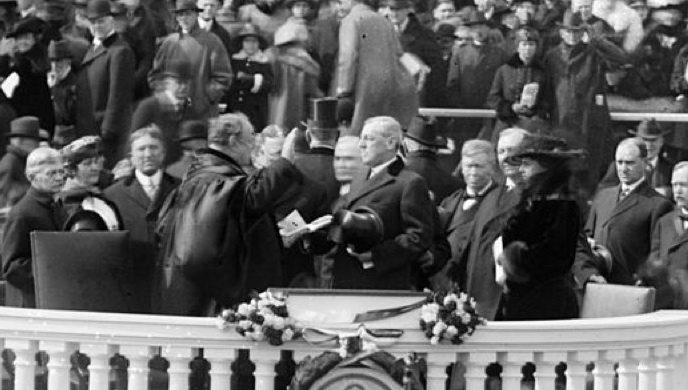 Wilson was sworn in on the East Lawn of the U.S. Capitol, facing the Supreme Court building. The new House members would be en masse on the left (or, Wilson’s right) when he would be addressing the crowd. Nowadays, this ceremony is conducted on the West Lawn. Note that the swearing-in was held in March; and, typical of Washington D.C., it is cold in early March. Everyone is bundled up! That must have been a culture shock for Floridian Emmett. The second video clip comes from Hulu. It’s longer and better quality, as folks are more experienced using film, obviously. The cameraman uses bigger sweeps of the crowd, so it is entirely possible Emmett was caught on camera! The ceremony was held March 4, 1917, and again, it was cold in Washington, D.C.
Because Emmett was not a candidate for a third term, and so would be officially out of office as of March 5, it must have been a bittersweet time for him to attend this last inauguration. He was headed home to Pensacola after this, permanently; he would be dead in about 15 months. It is cool knowing his is one of the faces in the crowd. I just wish I knew which one was his.